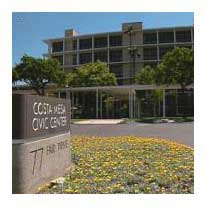 This is going to be a very interesting week at City Hall in Costa Mesa. Disregarding the probability of controversial and/or boneheaded comments by some members of the council, the scheduled events alone are going to make for some fascinating observation. Today, Monday, the Planning Commission has an interesting schedule of events for their meeting tonight. First out of the blocks will be the review of the new standards for residential and commercial common interest developments (condo conversions) that have been rushed into preparation because of the recently-imposed moratoria. You will recall that the council, in it's haste to "change things" in our city, went off half-cocked and finally had to be reined in before they approved conversions that were shoddy and haphazardly conceived. The debate of this subject should prove to be interesting. Then, ma sochist developer Barry Saywitz throws himself back under the wheels of the train as he presents his request for reconsideration of a condo conversion project on Victoria Street. This is significant for many reasons. The last time this item was heard by the Planning Commission rookie commissioner Jim Righeimer shredded Saywitz like a carrot going through a Veg-O-Matic. Now Saywitz brings this item back for a re-hearing, saying that he was not given a chance to address the changes in the project as it was approved, 3-2, the last time. He states in his paperwork that he's not interested in pursuing this project as previously approved because he can't make any money on it. This should really be fun to watch. I have this image of Righeimer pounding himself on the shoulder pads in preparation for the confrontation. They're also going to consider a request to put a Carmax Auto Superstore at the site of the old Wickes furniture store - another huge sales tax generator for our city. I find myself wondering whether, because of this locations proximity to the 405 freeway, might this not finally result in a huge sign advertising the Harbor Boulevard of Cars? It seems to me that most folks who actually go to a dealership to buy cars these days prefer those auto malls, where you can park your car and walk around, shopping for new wheels. I think the dealers along Harbor Boulevard can probably use all the advertising help they can get. On Tuesday the City Council will be briefed on the 2007-2008 budget by staff. We expect that Finance Director Marc Puckett and his staff have, as always, put together a solid, workable budget for the council to consider. For those who don't follow this process, Puckett and his team consistently win awards for their budget presentations and Costa Mesa has been recognized for it's solid financial position for many years. Then, on Wednesday, the Parks and Recreation Commission will hold a rare study session to consider the new proposed changes to the Field Use and Allocation Policy. This one has the potential for some very interesting speaker comments and dialogue, since there has been some very contentious debate on this issue recently. You can get a feel for this by reading Byron de Arakal's commentary in the Daily Pilot last week, here. All in all, it looks like a fun week here in Costa Mesa.